Thanks to Hank Saurage for his insights and observations as to what was working well at Wurstfest. 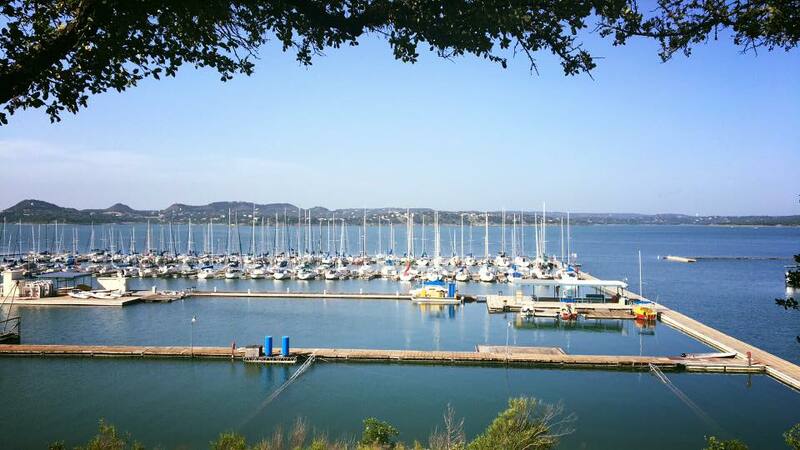 The winds were mostly lightish and the water flat on Canyon Lake. As I pondered on how to write the report, I realized there were notable observations made on the course that may be more beneficial to the readers than just the finish results. Saturday’s races were sailed in light and variable 5-8 mph winds. We had four 9s and three 7s. The 9s were sailed by individuals from 165-225lbs (75-102kg). 7s were sailed by 145-175 pounders (65-80kg). This is relevant in an observation below. For the first race, we had very light, shifty, up-and-down puffy winds. Jamie Gillman (145lbs/65kg) sailing a 7, was set up very loose with wrinkles along the luff, no kicker, and deep draft in his sail. Ash (215lbs/98kg) set up his 9 with deep draft, occasional kicker tension, no wrinkles. Me/Hank (164lbs/74kg) sailed a 7 completely loose like Jamie. Not my usual “secret” setup for these conditions, but I wanted to use this first race to experiment. Nathan Yokum, sailing his first Aero regatta in a 7 was very loose. Quentin Baker (guessing 190lbs/86kg), new to the class and first time racing with us, appeared to set up fairly loose on his 9, along with our KO rep Mark McNamara and Mike Lindstrom also sailing 9s. Off the line and up the first leg, we were all fairly close but the 9s having a clear speed advantage. I managed to round first with Jamie, Quentin, Ash, Mark right behind me. Ash quickly passed me, followed by the others going around me within a minute. Ash, heavier than most of us, worked up and down on the run, brilliantly playing the shifts to step out from the pack, followed by Jamie, Mark, and Quentin. Ash had very good speed and never seemed to slow down. Jamie had the loosest vang downwind and was scary fast by the lee, but was less of a threat when wind was on his windward quarter (his kicker was a little too loose for my comfort, which I feel attributed to the latter). Mark and Quentin were fast but not consistently on-pace with Ash. I was SLOW and clearly not adjusting well to the extremely loose setup. Mark sailed a great race to edge out Ash at the finish, Quentin and Jamie closing out 3rd and 4th with me squandering a 5th. Mike Lindstrom passed me upwind at some point with amazing speed and height forcing me away from the favored side of the course and ultimately sending me to the back. For the next 3 races on Saturday, I made drastic changes to my setup that proved very effective, allowing me to notch 3 bullets. What were those changes? First off, a loose kicker/vang does not provide an efficient sail plan when you are constantly playing the sheet in/out for puffy conditions. The sail shape changes radically with the up and down movement of the boom, each mast bend/straighten cycle sending the draft of the sail all over the place. In the last 3 races I maintained enough kicker tension to have “pre-bend” in the mast. Pre-bend sets the baseline for foil/sail shape. Be conscious not to over-kicker, but more is better than less. Very important to get this set up first in order to get an efficient, uniform shape using other sail controls. Efficiency is key to performance. This brings me to addressing the other controls. Use more outhaul upwind to reduce “drag”. Drag can be felt in the seat of your pants. It’s only fast part of the time, and usually at less than optimal angles going to windward. As you try to get more height, it drags…slows you down. Most notable is the inconsistent draft and shape top-to-bottom…very full at bottom, flat at top. An overly-loose outhaul leaves the middle of your sail screaming at you to make an adjustment as it’s confused between fuller or flatter, draft back or forward…caught between two extremes that don’t match up. I found 6” or so of foot off the boom worked well and sets up the sail for the third and last control, the downhaul. The downhaul is my favorite control line for optimizing sail efficiency. When you have no tension on it at all, you are using only the sheet, kicker, and outhaul for sail shape, and you can’t get optimum sail shape. You must use the downhaul. Why? Remember the screaming middle? Yep, Old Downhaul can quiet her down. As you start tensioning the downhaul, the draft and shape become more uniform in the rest of the sail, ideally slightly fuller at the bottom and flatter as you go up the sail. If you tension more, it flattens the sail (especially in the middle to top) and brings the draft further forward. Tension even tighter and you lose the top of the sail (the increased tension bends the top of the mast, causing the sail to twist/open up there). I find in lighter winds, tensioning downhaul slightly to pull the draft uniformly in line with the bottom and top of the sail is perfect...roughly 40% back from the mast. You should see softness along the mast but no wrinkles. I make lots of adjustments to maintain the shape as wind velocity changes. Working the kicker and downhaul together upwind, in many instances, is imperative for max performance and efficiency. Use the downhaul as your “fine tune” shape-maker in lighter winds. My downwind performance improved immensely with more leech tension being the driving force. Kicker/vang was constantly adjusted for the angle of attack. Keep some leech tension for control when reaching up, and ease a bit when sailing down by the lee (thank you Jamie…learned from you!). NEVER sail dead down! Also, be mindful too little or too much kicker are speed killers. There’s a fine line here. At no point above have I addressed sheet tension. Sheet tension really varies depending on how you’re set up rig-wise, wind/wave conditions, sailor/boat weight ratio, real-time tactical and strategic-driven factors, and skill level. There is no way to effectively quantify sheet tension with so many factors and variables to consider. I will share one little thought with you. Assume you have your rig and sail optimized for the conditions prevailing. How much sheet tension do you really need? Sunday, we started out with winds 10-12 mph, dropping below 8 mph by the end of racing. Close racing in first race, with Hank and Ash having an epic battle from the top of the first leg to the finish. Mark again showed outstanding upwind prowess to round second at the top but faded back a bit on the long downwind. My upwind speed in the 7 was even with the 9 rigs. Observation: Ash was “dragging” upwind with outhaul too loose, allowing me to stay right with him. Others were having the same results with loose outhauls. Alternatively, too much/tight outhaul results in loss of power. Stay away from extremes. Last race, wind increased in the middle of the race and I was in my element on the second beat to gain a substantial lead by the finish. What works for me in fully-hiked, gusty (overpowered) conditions is using the downhaul as my throttle and the sheet for control. Harder on downhaul to throttle down and open up the top of the sail as gust approaches, then sheet out when it arrives, sheet in as it passes, ease downhaul to throttle back up. That’s the sequence. Adjust kicker to velocity and relative sheet tension. I think I’m done here. Hope some of this makes sense and those of you who stayed with me get to try these techniques for yourselves to determine what works for you. I was in a 7, not a 9. The sails and rig are significantly different. My 9 setup is slightly different due to the cut of the sail, mast flex under load, longer battens at the top, etc…just requires a different tune. What’s important is to maintain an efficient sail plan for maximum performance as close to 100% of the time as possible. Thanks for reading. Wurstfest marks and end to the 2017 RS Aero season in Texas. For some winter sun join the RS Aero Florida Winter Series, held over 5 weekends December-April at some of Florida's best sailing venues. Details on the North American Events List.